Figure 33.1. In situ immunohistochemical detection of κ and λ FLCs in the CLL microenvironment. (A-B) In lymph node infiltrates of a κ-chain CLL case, a prominent population of plasmacytoid lymphocytes expressing κ FLCs is detected along with a lower number of lymphocytes expressing the clone-unrelated λ FLCs, both populating the same microenvironment. Scattered plasma cells with either κ or λ FLC expression are also detected (panels A and B insets). 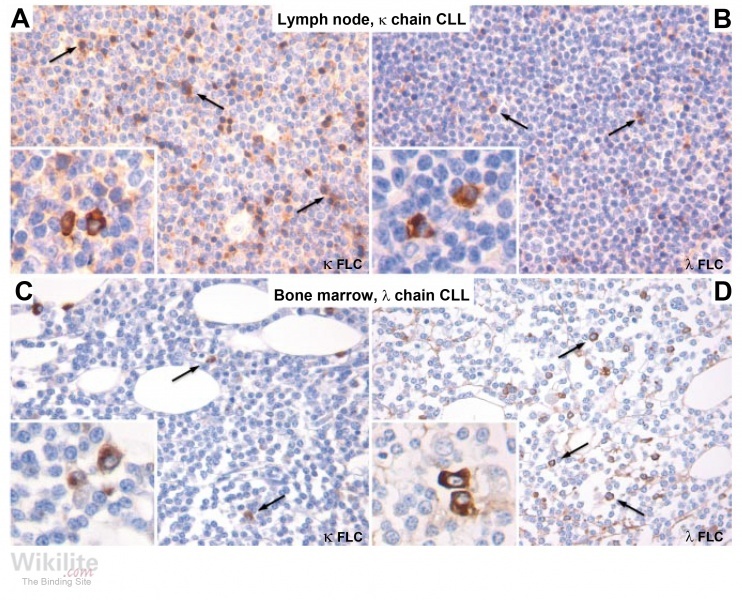 (C-D) A similar picture is observed in bone marrow lymphoid infiltrates of a λ-chain CLL case. Immunohistochemistry performed by the labelled streptavidin-biotin method with 3-3'-diaminobenzidine as chromogen (brown signal). Original magnifications x200 for all panels, and x400 for insets. (This research was originally published in Blood © the American Society of Hematology). CLL is thought to originate from the expansion of an antigen-activated B-cell clone. Persistent immune stimulation and polyclonal B-cell activation/dysfunction may play an important role in its pathogenesis . This is supported by research demonstrating that increased concentrations of both monoclonal and polyclonal free light chains (FLCs) exist up to 10 years prior to CLL diagnosis . FLCs are the most commonly detected serum monoclonal proteins in CLL, with an abnormal sFLC ratio being reported in 30 - 40% of patients . By comparison, Maurer et al. reported 16% of patients with a monoclonal protein detected by serum protein electrophoresis. In several published plasma cell disease screening studies, addition of sFLC analysis to the testing panel has identified additional CLL patients (Chapter 23) . Therefore, identification of abnormal sFLC ratios in screening samples should prompt the consideration of other lymphoproliferative disorders, particularly CLL, in addition to plasma cell dyscrasias. Maurer et al. characterised both monoclonal and polyclonal FLC abnormalities in 339 newly diagnosed, untreated CLL patients. They defined three different types of FLC abnormality: monoclonal FLC elevation, polyclonal FLC elevation and ratio-only abnormality (Table 33.1). Table 33.1. sFLC abnormalities in newly diagnosed CLL patients . In patients with an abnormal sFLC ratio (ratio-only abnormality or a monoclonal FLC elevation), the involved sFLC type matched the CLL B-cell light chain restriction in 92% and 96% of cases, respectively . Such findings suggest that an abnormal sFLC ratio is disease-related in the majority of cases. Morabito et al. studied the distribution of monoclonal and polyclonal FLC synthesis in the CLL tumour microenvironment by immunohistochemistry. Lymph node infiltrates comprised a prominent population of plasmacytoid lymphocytes expressing the involved FLC, along with a smaller number of lymphocytes expressing the corresponding uninvolved FLC. These lymphocytes populated the same infiltrates in the lymph node and bone marrow, and were associated with scattered FLC-producing plasma cells (Figure 33.1). Polyclonal B-cell activation found in CLL also underlies the pathogenesis of some inflammatory/autoimmune conditions (Chapter 35). Interestingly, both CLL and inflammatory/autoimmune conditions may be associated with lymphomatous transformation. This occurs in approximately 5 - 15% of CLL patients, and histologically resembles diffuse large B-cell lymphoma or Hodgkin lymphoma (Chapter 31) .